Note: Our Valley of Fire, American Southwest Extreme and Zion Extreme workshops are back to back, so you can book all three to extend your time in Utah! Are you looking for adventure? Do you want something that combines your love of nature, photography and outdoor activity? Well, the Aperture Academy is here to deliver. If you're physically fit and able to hike 4-5 miles in a day, then come join us in Zion National Park for a weekend of excitement and photography in one of the most majestic places in the Southwest. Some people call Zion, the Yosemite of the Southwest. With its towering red rock walls and river filled valleys, Zion is an oasis in the desert for sure. During our weekend together, we'll take you to some of the best spots in the valley, during the best time of the year. Fall brings with it significantly cooler temperatures than the summer and spring, which turns the cottonwood trees to beautiful yellows and oranges. We'll spend our first day exploring the valley and taking in some of the more iconic views, such as the Emerald pools, Weeping Rock, and The Watchman. The day will be filled with smaller hikes and seemingly endless photography opportunities in Zion Canyon and along the banks of the beautiful Virgin River. The second day will be full of adventure. We'll rise early and take the Zion National Park shuttle to the mouth of "The Narrows." The adventure begins from there. We'll leave the comforts of a maintained trail and go into the river to work our way forward through the narrow, thousand foot high canyon walls. Our compositions will be filled with moving waters, and the vibrant reds, oranges and yellows of the magnificent canyon. The photography in this area of Zion is among the best in the world. 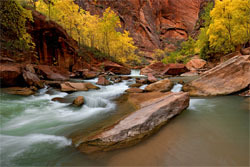 Landscape photographers make the pilgrimage here every fall to capture the splendor of the Virgin Narrows. We'll be there too...in the best time of year. We'll spend all morning and afternoon in the Narrows, slowly making our way to the Orderville Canyon Junction, where the canyon walls tower high above us. Then, we will make the return journey out of the canyon, where the light has now shifted and new photographic opportunities await. 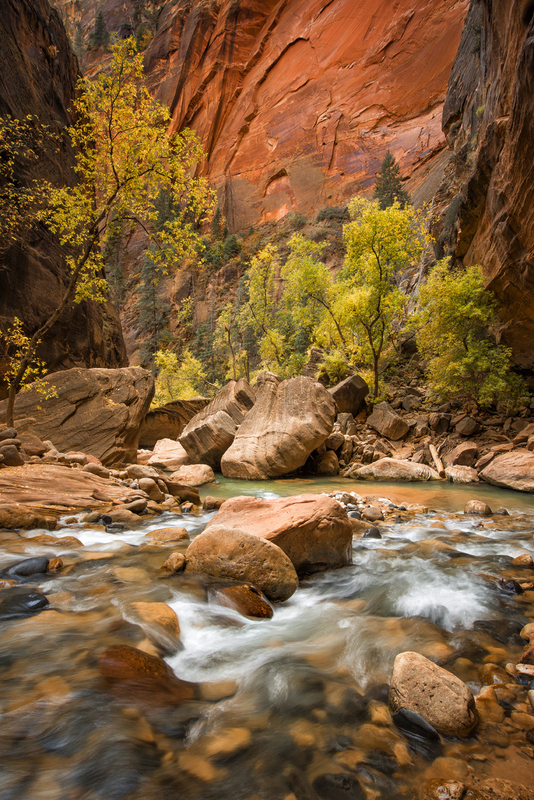 The Zion Narrows hike is widely considered one of the best, most beautiful, hikes in the world. Photographing it takes a special set of skills that the instructors at the Aperture Academy can provide you with, so that you come away with images as fantastic as the hike itself. Why not come spend the weekend with the Aperture Academy, your camera, and other like-minded enthusiasts, and have the adventure of a lifetime? This workshop will fill quickly, we recommend booking in advance. IMPORTANT: Ability to hike 4-5 miles over the course of the day. This workshop is rated "extreme." We will take a break mid-day, each day, for lunch and rest, and another break for dinner. There are many restaurants in the area.